and Omani, regional and international employers can hire the right talents. Looking for part-time or full time employees? Please contact us for all your HR requirements. 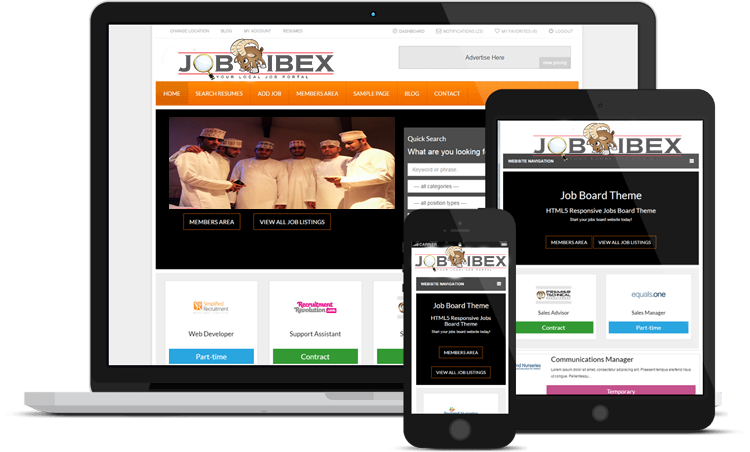 Since inception during the 2nd half of 2012 www.jobibex.com has become a key player in the online recruitment domain in Oman. The number of registered job seekers profiles grew from a few hundreds in 2012 to almost 100,000 by the end of 2016. Our database consists of Omanis and expats, fresh and experienced, entry level, junior, middle manager, senior and top executive representing a wide spectrum of professionals. On the employers front, the number is growing by the day as we increased from 7 registered employers in 2012 to 109 by the end of 2016. We have proudly serviced banks, insurers, financial services providers, contractors, oil and gas companies, auto dealers, retailers and many others. Despite the fact that our services are geared to online promotion of jobs but we extend our recruitment efforts offline. We are a proud of our security measures that enabled us to protect sensitive user information. Anyone can register as a job seeker and enjoy all basic tools such as searching for and applying to posted vacancies. The platform is built with the user (both job seekers and employers) in mind. The website is fast and easy to navigate. The platform is designed to accommodate as much jobs, job seekers and employers as possible. Our job portal can be accessed through major social media such as Facebook and LinkedIn. In addition, jobs listed on www.jobibex.com are automatically fed into our social media accounts for higher viewership. Most of registered profiles are of Omanis fresh and experienced. Companies rely on us to help them achieve Omanization strategy. Our job portal does not list jobs and collect resumes only but it also provides live market updates and analysis to enlighten job seekers and employers about the recent events in Oman employment market. www.jobibex.com uses the world’s best recruitment platform currently used by over 2,000 employers and recruiters around the world. Expats with Oman or GCC experience are predominately perceived as better-fit for jobs in Oman given their prior knowledge of the market. Just imagine the hassle an expat has to go through to obtain the driving license! In addition to standard recruitment service, we help you run reference check on selected candidates to eliminate any unpleasant surprises or concealed facts after signing the candidate in. We have established tie-ups with a number of reputed law firms and fully understand the dynamics of labor laws in Oman. We will furnish you with basic legal advice pertaining to your recruitment activities. This has helped our clients focus on the recruiting process and not to worry much on the legal parts.